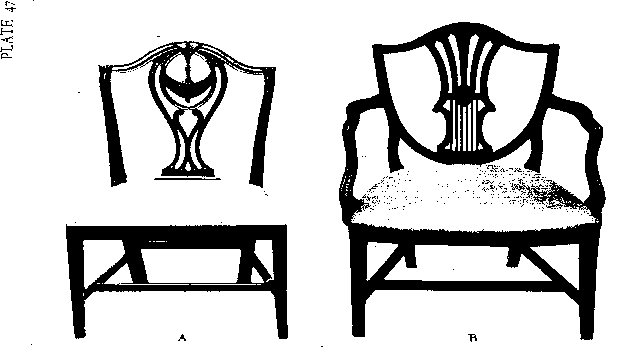 The shield-back and interlaced-heart chairs (Plates 47B-51) are of course Hepplewhite—they are so charadteri^lic that they are as easily recognised as the Chippendale chair. Sheraton also gave two designs for shield-backs (one of them appears in Plate 68 A) but the top-rails were flattened: as they do not seem to have been made in America they need give us no concern. Before the typical examples, came those that were a transition from the Chippendale ¿lyle to this, and which preserved the earlier back uprights, or ¿tiles, while adopting the serpentine top-rail and Hepplewhite ornament—Plate 47 A. The back of the chair illustrated is full of charming Hepplewhite details and the tapered legs are of this &yle. 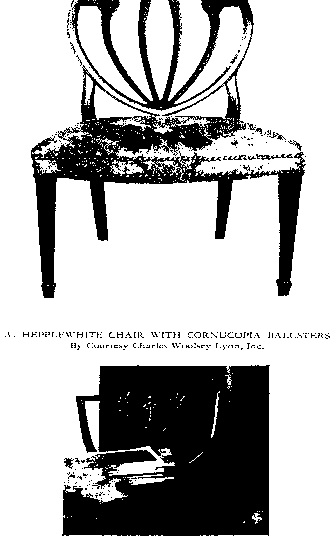 The wheat-ear is a very frequent ornament at the top of these chairs and it also appears in the next example, which is in the full Hepplewhite mode. 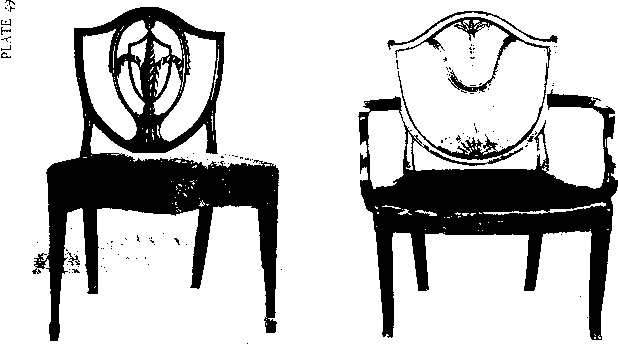 Another early chair is the hoop-back; often with a depression in the hoop at the centre, or two depressions —one at each side of the centre. These early chairs are in England credited to the Hepplewhite school, but whether George Hepplewhite had any hand in them we do not know. The upholstered shield-back was a Louis XVI mode, but Hepplewhite took it over, filled the back with a variety of fine designs, and made the type his own. The three feathers of the Prince of Wales was one of his favourite motifs. In Plate 49 A this device is, unusually, rendered in palm leaves. The Hepplewhite chair is of great refinement and beauty. There is inherent weakness in its conStru&ion of back, but the formal social life of England did not expose it to great risk of breakage: here these backs were sometimes made heavier. In any case numbers of them have survived a century and a third of usage. The securing of the arm-supports at the sides (as in Plates 47 B and 49 B) was a favourite method with Hepplewhite, but he did not confine himself to it and two other treatments are shown in Plates 51 B and 52. The variety in the forms of seats should also be noted. The covering of the seat-rail was moSt usual but the drop-in seat also occurred. The serpentine form of the bottom of the seat-rail, sometimes seen, was derived from Adam. How do i know if the Shield back are made by Hepplewhite? How to make hepplewhite table legs? 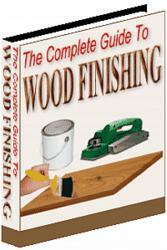 Did century furniture make copies of French fauteuil and Hepplewhite chairs in 1970's?